I’m back from across the pond. Great students, terrific food, awesome sights…did I mention they drink a lot of tea there? I’m not a coffee drinker, but I do have a cup of tea every couple of years. Heavy on the lemon and sugar. Actually, I think I have tea with my hot lemonade. Tea, I learned, must only be made with very, very hot water. Plop the tea bag in the cup and pour the water over the top. Let it sit and steep for a few minutes and then be careful not to burn off the tip of your tongue. My daughter Jennie is a big tea drinker, so I brought home tea for her and for my friends—nearly 16 pounds worth. (UK currency, not US weight.) I got a box of everything they had on the shelf at the Waitrose store and packed it in my carry-on. Sadly, on the way back to the States airport security changed the rules. I was allowed a roller bag and computer bag on the way there but only ONE BAG on the way home. (They kept this a secret until I arrived at the airport.) The ticket agent at Northwest asked if I could I put my computer bag INSIDE my roller-bag? I don’t know, do I look like Houdini? Eight hours on an airplane is not something I look forward to. That’s a long time to sit and stare at the back of the seat in front of you. I bring things to pass the time: sewing, books, computer, food… And then I bring things I might need: toothbrush, wallet, pen, gum, highlighter, extra thread, dental floss, decongestant, vitamins, tissue, camera, computer cord… I also carry valuable things I don’t trust to checked baggage: quilts, electronic gadgets, and 16 pounds of tea. The Northwest agent assured me that security would boot me out of line if I showed up with two bags. I thought I’d give it a go anyway. No dice. The security team gave me the heave-ho as soon as they spotted me, so I found a secluded corner of the airport next to the information desk, spread out the contents of both bags on the floor, and made like Houdini. First I filled my coat pockets with camera, ipod, external hard drive, and two tangerines. Then I reshuffled lecture notes, sewing kit, quilts, books, and tried to jam the computer bag inside the roller-bag. Not even close. Something had to give. I couldn’t even get the zipper closed when I sat on the bag. 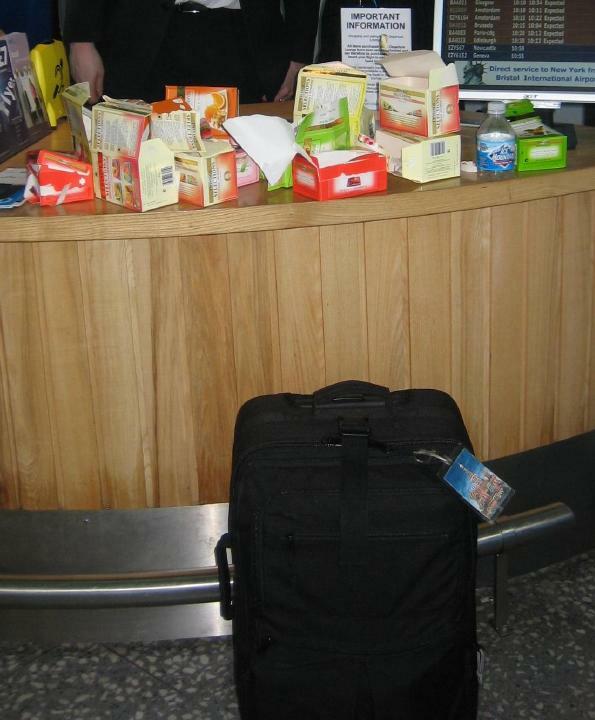 Not to be vanquished by airport security I decided to take the tea out of the boxes. They weren’t in great shape after I sat on the roller-bag anyway, so it was an easy choice. Little teabag pouches took up far less room and smelled kind of good too. I was feeling pretty smug, outwitting security. I could see myself sailing through the metal detector unchallenged, and even getting to the gate before the plane left. After the first few boxes however, I noticed I had inadvertently bought tea in little pouches. What are THOSE for?! The pouches were very large compared to the teabags and had no strings. Moreover they were unwrapped, very “dusty,” and highly aromatic. Great. The sniffer dogs were going to have a field day with me. I sincerely hoped that drugs were not transported in little pouches such as these. As it was, my quilts were going to smell like Cotton, Thread & Raspberry Mango Ginseng. Long story short (kind of) I jammed everything in ONE bag, nearly bursting, and made it though security— except for my scissors which they wanted to inspect personally. The security person tried to cut himself with the tip of my blunt tipped Ginghers to see if they were, I don’t know, DANGEROUS? (Not the sharpest crayon in the box, but he determined me to be harmless.) Once out of sight, I promptly re-shuffled everything back to its original configuration in TWO bags and nobody looked at me twice the whole trip. The assorted packaged teabags are ready to give away. The only lasting effect from the ordeal is the recipients will have to identify by aroma alone as the labels remain on the boxes I had to discard.